Trim:LX w/ Rear Camera,Bluetooth,One Owner,24k Miles! Like New, One Owner, REAR VIEW CAMERA, BLUETOOTH, Only 24k Miles, CARFAX / AUTOCHECK and STATE CERTIFIED with BUYBACK GARANTEE, Automatic, Loaded w/Power Options, STEERING AUDIO CONTROLS, MP3 SATELLITE COMPATIBLE RADIO, Alloy Wheels, STILL UNDER FULLY TRANSFERABLE FACTORY WARRANTY...If you appreciate mechanical refinement similar to what you might find in a commercial airliner, the Honda Accord is the clear choice in its class segment. And even if you don't easily discern such qualities, just-right steering and pedal feel are the kinds of qualities that quietly contribute to long-term driving satisfaction. The Accord still feels like one of the biggest cars in the segment, with two roomy and extra-comfortable front buckets and a back bench you and two friends can stretch out on. Moreover, the capacious trunk is even larger, maximum volume having increased by over one cubic foot. It’s not the lightest car in its segment, but it feels it. 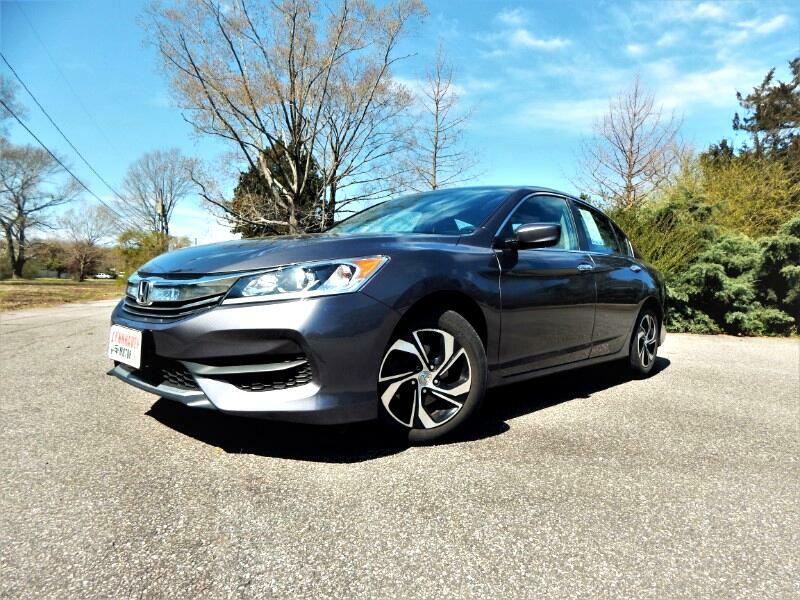 The steering, the brakes, and the suspension work in harmonious balance to make the Accord seem agile and springy. Yes, instead of control arms, it now has struts in the nose, but so does a Porsche Cayman. The Accord hustles through turns with fog-free steering and little complaint from the tires and never seems to be working very hard. You wanted a mid-size family sedan that feels as if it were made of much higher level material... this is your car. You want value, reliability, and low cost maintenance...this is your car. Makes for a sound investment. As with any other of our vehicles, you may have this one pre-inspected by your trusted mechanic prior to purchase. We strive to only keep high quality vehicles with low mileage offered at the most competitive price. We are a family run independent Dealership with over 30 years of experience serving families, and our low overhead translates to lower prices for our customers. Each of our pre-owned certified vehicles goes through a 108 point check and Virginia residents receive a brand new State Inspection. Visit us online at www.lynnhavenmotors.com to see more pictures of this vehicle, or call us at 757-425-9300 today to schedule your test drive. Vehicle Inquiry for 2016 Honda Accord LX w/ Rear Camera,Bluetooth,One Owner,24k Miles! Trim: LX w/ Rear Camera,Bluetooth,One Owner,24k Miles!